Prerana is using Smore newsletters to spread the word online. Slavery, the peculiar institution, is what keeps you from freedom. For darkies like you, escaping is the first and most likely your only path to freedom. The best time to escape is at night when your overseers are sleeping unless you'd like a severe flogging for trying to escape. Your goal is to get north. Canada is the final goal, but crossing the 30'60'' parallel is the first step. Escape in the night, when no one is looking. To mask your scent, swim in a river. Remember to cover your tracks. Your best chance at escape would be during a rainstorm. Dogs can neither hear nor smell you during a storm; your tracks will also get washed away by the rain. Finding north isn't always easy. Your best bet is to locate Polaris, the northern star. It is not a big star or bright so it may be difficult to locate. To find it, look up in the night sky and find the Big Dipper or the Drinking Gourd. At the furthermost point of the gourd is a star, this is Polaris. The gourd points north. But this is only useful at night, during the day try looking for moss. Moss always grows on the north side of rocks and trees. Along the way you'll need a safe place to stay, you'll find safe houses along the way. I recommend that you should cross the Ohio River and into the state of Ohio. Everything below the 30'60'' parallel is a part of the black belt, where the slaves are. From there, make your way up to Cleveland and cross through Lake Erie into Canada. This is the quickest and most efficient way into Canada. The route once you reach the upper south starts at Ripley on the banks of the Ohio River. This is in Kentucky and it is best to cross the river at night. Swimming is not advised, however there should be a former slave or a supporter of the abolitionist movement to help you cross. From there you must head to Columbus and then Cleveland. 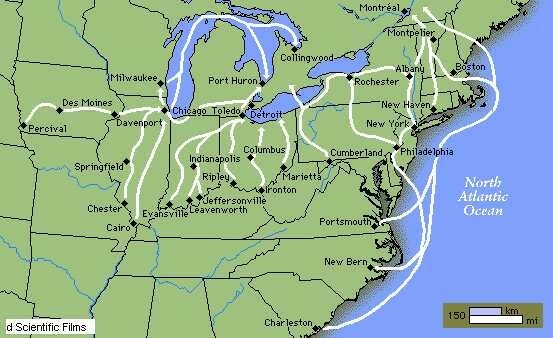 From Cleveland, enter the docks of Lake Erie and you will find a ship for slaves to cross to Canada. Good luck fellow slaves on your journey to freedom. Perhaps, once you cross into Canada you can garner support for the abolition of slavery. There are those, like Denmark Vesey and Nat Turner that work in the south, and there are those who work in the north. Good luck on whatever your destination is.